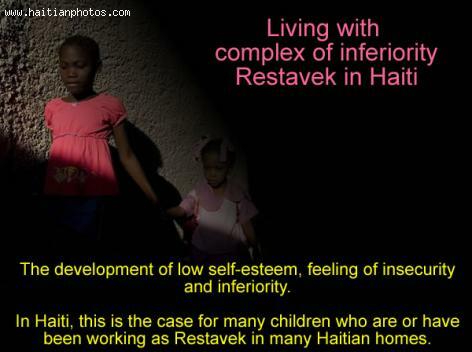 Restavek is a cruel and inhumane practice that has been allowed to flourish in Haiti for decades. Restavek, translated from Créole, means "to stay with". In this system, ignorant parents, who cannot support their children, deliver them to families, who ostensibly can. But in truth, they are anything but cared for. Sent to work as house servants, young girls between 5-15 years are beaten and sexually abused, forced to sleep on the floor. They must begin laboring at dawn, doing tasks that are humiliating, like washing out bedpans; or hard labor, carrying heavy pails of water from wells back to their houses. The international community is aware of the horrors of restavek, and increased numbers of Christian and non-profit organizations are working to save children and educate Haitian communities the practice is immoral and unacceptable. In Haiti, restavek is embedded in the culture. Organizations like Restavek Freedom Foundation (RFF) are administering outreach programs to educate Haitian ministers, as well as children and teens, whose families may keep restaveks, of the wrongness of it. Besides raising awareness, RFF is also offering school vouchers, literacy, maternity, and health classes to children and teens they have rescued. Girls saved from restavek circumstances go to group homes, where they discover love, safety, and their value as human beings they have been denied. In the U.S., RFF has organized a "Run to End Restavek" to raise funds and public awareness of the endemic practice of restavek in Haiti.